Character: Young, impetuous, rough and edgy. Straight ahead, with beautiful intensity and typical Laphroaig. Iodine, peat, smoke, ash, oak. Review: For long winter evenings and cold prevention, a Quarter Cask large bottle in the domestic medicine cabinet is certainly good. Definitely suitable for enjoyable Easy Islay Drinking. On a balmy summer's night I also imagine it as a barbecue or as a companion around the campfire. To get in the mood, you can smell wonderfully with an iodine ointment. Good 86 points and I notice that I have not had a standard 10 in the glass for a long time. Description: Straight away a typical Laphroaig. My Laphroaig benchmark, which I know best, is the 18's. 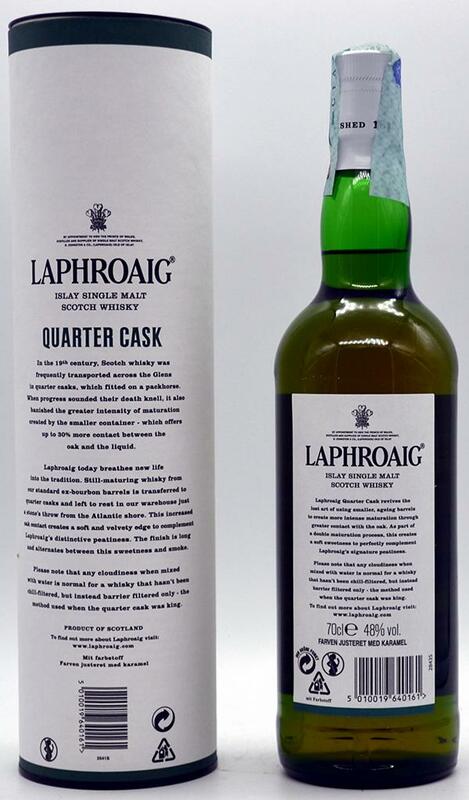 As expected, the Quarter Cask is much less complex, but still a bit more medical. There is really a good dose of job and the gauze band on top. 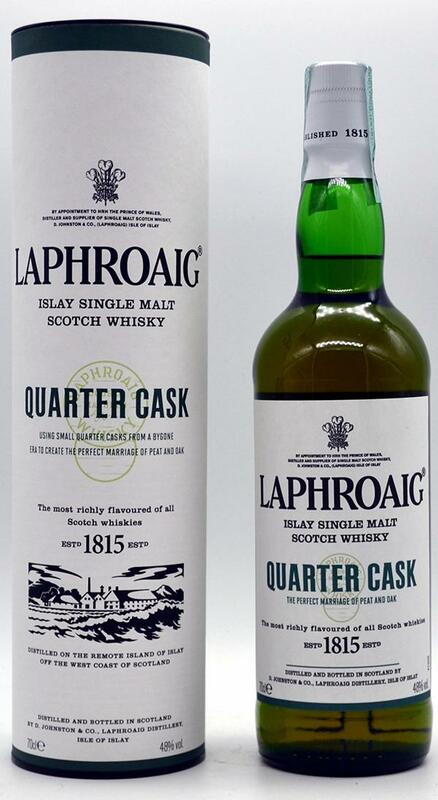 In addition, the Laphroaig-typical peat smoke, some heather and subtle hints of lemon. Some malt also resonates, but a little less sweet than the 18s. Is he maritime? Somehow, but somehow a bit limited. A real broadside sea breeze and intense algae misses me the Quarter Cask at least not. 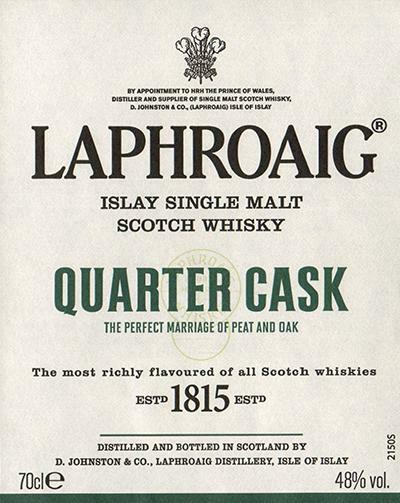 Description: Young and slightly impetuous, the Quarter Cask bites its tongue. Immediately there is a lot of peat smoke with a decent ash impact. Accompanied by a slight biting on the tongue, a good deal of iodine rolls through the mouth. In any case, the nose has not promised too little medicine. The iodine and the smoke clearly dominate the taste and apart from a little bit of malt I can - not least because of the intensity - make hardly any other flavors. I really like the fact that the oak is added to the finish and that it rounds off the intense boisterous flavor with a nice almond taste. Description: The finish is intense and long. As it tastes, it sounds like it. Iodine, peat smoke and ashes in front of an oak and malt backdrop. 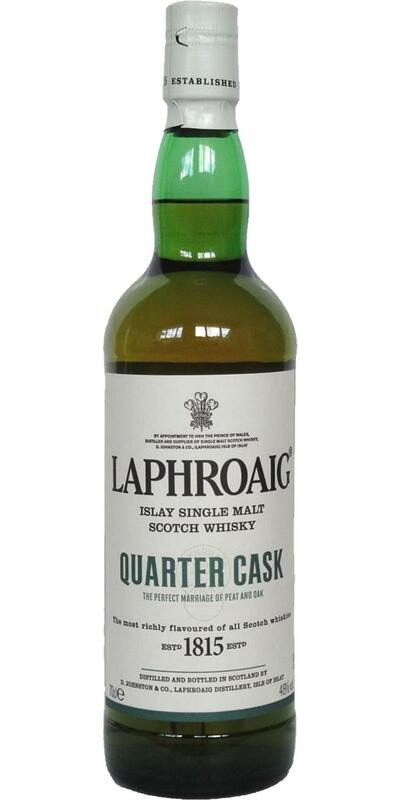 With a slightly adsting, but not disturbing feeling on the tongue, the Quarter Cask sounds consistent. It's the Laphroaig nose, it would be recognized among a thousand. But this one is a hair more abrupt, more smoked, less iodized and more syrupy. We feel the influence of bourbon, it goes very well with ash and betadine, softening slightly. The little that is modified in the nose is modified to taste. A slight sweet influence, but overall we remain in a known universe, caramel, chocolate and cola, married with peat and vegetal notes. A somewhat sparkling finish, full of coffee and moderately long. We appreciate the power of alcohol, and that of peat, nevertheless I prefer the 10 years of age, more refined and more typical. Solid and delicious. 80 points. Ash. Unripe bananas. Sweet. Wood. Long, a bit bitter. Sweet.